I noticed that my parents neighbors tulips and daffodils were beginning to grow and that made me really happy. Soooo happy, in fact, that when I arrived back home, I planned out when I was going back to the Botanic Garden to begin my annual stalking of the tulips and other spring blooms (next weekend!) and I shopped for Spring Green related items on etsy. 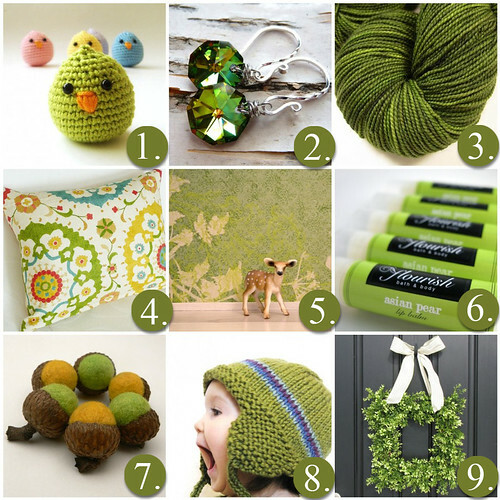 These are my fabulous Spring Green inspired finds-- I hope you enjoy! isn't that bunny the cutest thing ever? 7. Six Felted Acorns - Lemon and Lime - Natural and Eco Friendly. Thanks so much! I'll be back tomorrow with an fabulous interview from an etsy artist! Don't miss it-- Click here to subscribe today and you'll see my posts in your blog reader automatically!